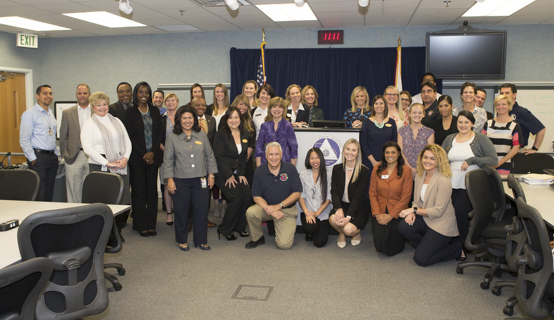 Central Florida’s communication professionals recently gathered at Orange County’s Emergency Operations Center to discuss disaster preparedness strategies and the role of public information officers (PIO) during an emergency. The Central Florida Communicators Meeting is hosted bi-annually by Orange County Government’s Communications Division and is attended by communicators from throughout Central Florida representing area hospitals, municipalities, utility providers, higher education institutions, regional transportation and mobility agencies, theme parks and travel and leisure organizations and other organizations. The goal is to build relationships as well as review and discuss emergency preparedness tactics and efforts to be best prepared should a natural disaster or tragedy affect the community. Many Orange County Government staff are certified and trained emergency responders in the National Incident Management System program. This training is facilitated by the Federal Emergency Management Agency (FEMA) and is critical for immediate response during disaster situations. It also helps responders communicate with citizens and one another in one clear voice. The group discussed the use of joint information centers (JIC) as a primary disaster preparedness strategy. Serving as a central location for communicators during disaster situations, a JIC allows communicators to perform critical emergency information functions, crisis communications and public affairs functions. Broward County Fire Rescue Public Information Officer Mike Jachles spoke to the group about his experience working and leading JICs and how the crucial strategies and skills can be applied to significant events and daily operations. Jachles serves as the coordinator for Florida’s PIO Deployment team and most recently helped facilitate the JIC in response to the Fort Lauderdale Airport shooting. Orange County communicates with citizens in numerous ways during emergency situations. Citizens may access updates by downloading Orange County’s free smartphone applications. OCFL Alert provides open shelter locations, water and ice distribution centers, evacuation routes, public service announcements and much more. The OCFL News app provides breaking news and the OCFL 311 app allows users to photograph, pinpoint and report any problem encountered before, during or after the storm directly to Orange County’s 311 Service Center. OCFL 311 also maps relevant community information that may impact neighborhoods. Citizens can also register for the OC Alert system, which sends emergency alerts, notifications and life-saving instructions via text message to cell phones and email accounts. Additionally, citizens may follow Orange County’s social media pages. For more information, visit Orange County’s emergency information webpage. Navigate through the following tag links with the arrow keys. Use the Tab key to skip to the footer links. Copyright © 1996 - 2019 Orange County Government, Florida. All rights reserved.